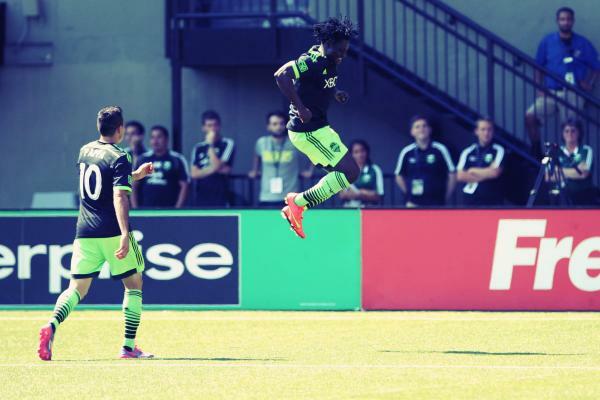 HT - 45 minutes are up and YOUR @SoundersFC leads the @TimbersFC by a score of 2-0 at Providence Park! HT - Andddd let’s hear your thoughts, #Sounders supporters?! What do we think? Not too shabby. Send me your comments/jokes/recipes/fun NOW! 46’ - And a yellow card for Chad seconds into the half for taking down Urruti who is up on his feet quickly. 47’ - DeAndre all over it and clears it out confidently. 47’ - Good pressure to start from Portland but Seattle resisting well. We’ll see our first #LeoThrow of the second period as well <3. 48’ - Obes with the back heel. Swoon. 50’ - Valeri gets through the middle and forces a cheeky foul from Marco. Nearly dead center FK chance here in front of the Timbers people. 51’ - And it’s bangggggged off the wall there and cleared to the corner. Over there, Zach is battling and a foul is called. Ok.
51’ - It’s played in and OBES WITH THE HEADED CLEAR. 52’ - Sounders with their first foray into the Timbers side of the pitch now. Trying to settle things down a touch. 53’ - Congratulations Urruti, you’ve won the #ZachScottd contest of the year on the break. Like BOOM. 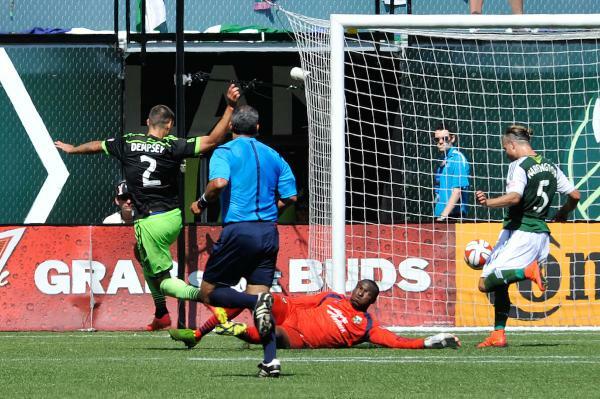 53’ - From the #ZachScotting , Timbers rush forward but Johnson’s shot is SAVED by Frei and the rebound goes over. HUGE. 54’ - Scott saw yellow for that one. Yep.